District town in the government of Mohilev, Russia. At the census of 1898 the total population was 6,536, including 3,172 Jews, of whom 587 were artisans. Most of the Jews are extremely poor, and at times they lack the simple necessities of life. One hundred and twenty-seven families had to apply for relief at the Passover. There are a "biḳḳur ḥolim" society (for the visitation of the sick), a "linat ha-ẓedeḳ" (poorhouse), and a "kibbud yom-ṭob," society (an organization for providing help during holidays). In the vicinity of Bykhov are situated Sapezhinka (a village where 44 Jewish families own 357 deciatines of land) and an agricultural colony, Vynn (with 20 Jewish families who own a tract of 200 deciatines). During the uprising of the Cossacks under Bogdan Chmielnicki, 1648-49, the greater part of the Jews of Bykhov, who did not embrace Christianity, were killed. 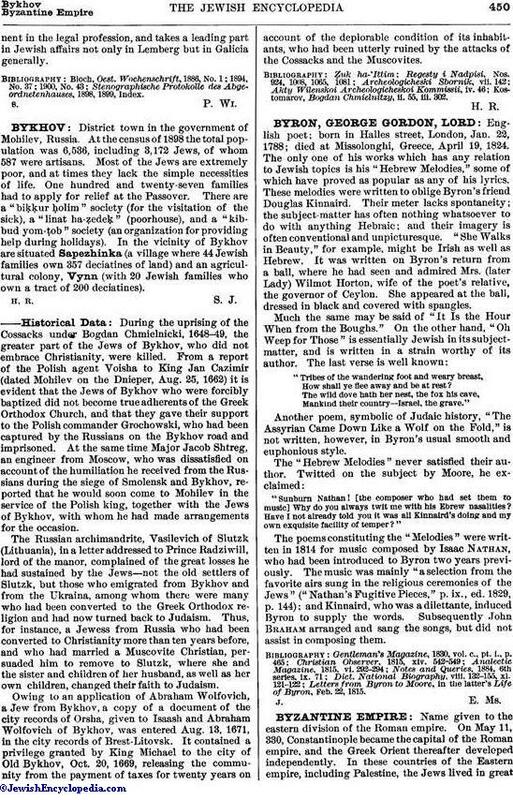 From a report of the Polish agent Voisha to King Jan Cazimir (dated Mohilev on the Dnieper, Aug. 25, 1662) it is evident that the Jews of Bykhov who were forcibly baptized did not become true adherents of the Greek Orthodox Church, and that they gave their support to the Polish commander Grochowski, who had been captured by the Russians on the Bykhov road and imprisoned. At the same time Major Jacob Shtreg, an engineer from Moscow, who was dissatisfied on account of the humiliation he received from the Russians during the siege of Smolensk and Bykhov, reported that he would soon come to Mohilev in the service of the Polish king, together with the Jews of Bykhov, with whom he had made arrangements for the occasion. The Russian archimandrite, Vasilevich of Slutzk (Lithuania), in a letter addressed to Prince Radziwill, lord of the manor, complained of the great losses he had sustained by the Jews—not the old settlers of Slutzk, but those who emigrated from Bykhov and from the Ukraina, among whom there were many who had been converted to the Greek Orthodox religion and had now turned back to Judaism. Thus, for instance, a Jewess from Russia who had been converted to Christianity more than ten years before, and who had married a Muscovite Christian, persuaded him to remove to Slutzk, where she and the sister and children of her husband, as well as her own children, changed their faith to Judaism. Owing to an application of Abraham Wolfovich, a Jew from Bykhov, a copy of a document of the city records of Orsha, given to Isaash and Abraham Wolfovich of Bykhov, was entered Aug. 13, 1671, in the city records of Brest-Litovsk. It contained a privilege granted by King Michael to the city of Old Bykhov, Oct. 20, 1669, releasing the community from the payment of taxes for twenty years on account of the deplorable condition of its inhabitants, who had been utterly ruined by the attacks of the Cossacks and the Muscovites. Kostomarov, Bogdan Chmielnitzy, ii. 55, iii. 302.